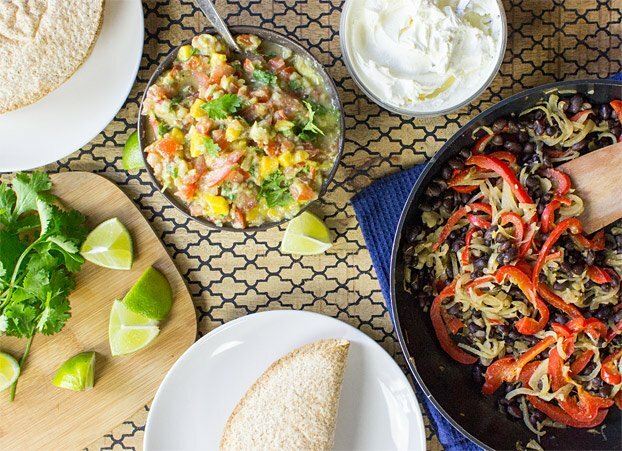 Mexican Vegetarian Tacos | Authentically Awesome! Mexican Vegetarian Tacos – Authentically Awesome! 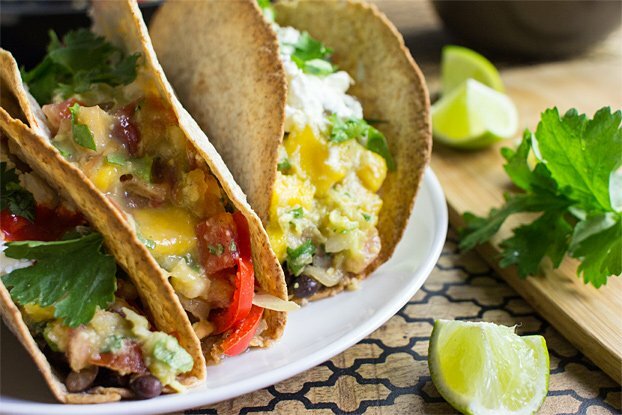 These vegetarian tacos are really hard to beat. 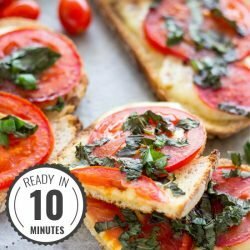 It’s one of those recipes that we highly recommend you learn and commit to your repertoire. 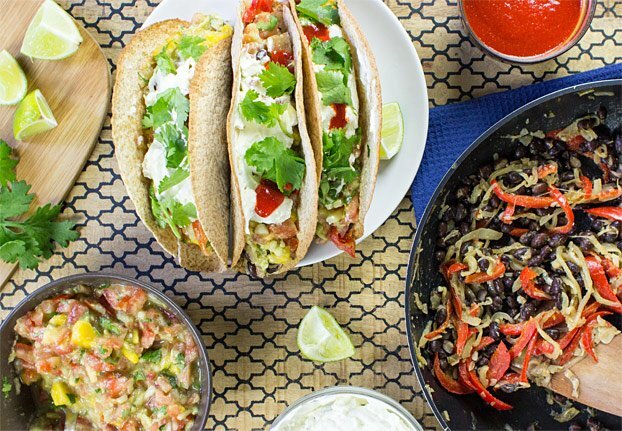 Once you know this veggie taco recipe, you can pull it out of a hat any time you need. There are sooooo many reasons to do so. If you don’t have tacos or forget to buy some then you can still eat the rest of it with an alternative like rice, potatoes, wraps or sweet potatoes. Avocados – the healthy fats in these bad boys are off the charts – get some down you! 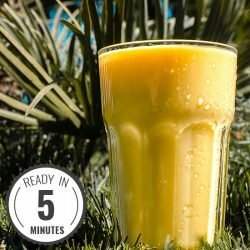 Mangos – who really needs an excuse to eat mangos? Not only do they taste great, they’re one of your much needed fruits/veggies each day. Bean, beans beans. 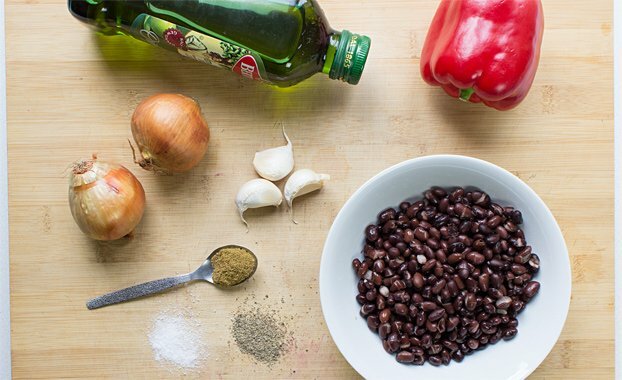 Vegetarians in particular should be looking to eat a decent amount of beans and legumes often – they’re high in protein and plenty of important nutrients! If you need a (free) high-protein meal plan, come over here. Originally tacos (or even veggie tacos) meant the main meal, but over time tacos have come to mean these hard shells (as in the pictures). If you did indeed forget to buy tacos but really fancy them and have wraps to hand, you’re in luck. You can make your own tacos by taking a wrap and hanging it over the wire in your oven (see pic). This will crisp up and harden and become a ‘taco’. Perfect. To do that, just heat up the oven to 180°C/360°F and let the wraps hang in there for a maximum of 5 minutes. As mentioned already – even if you don’t have the tacos, the filling is so good you’ll just want to eat it with something else instead! Rice or potatoes are awesome and super-satisfying too. 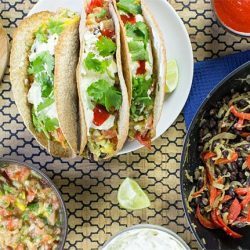 Vegetarian Tacos - Authentic Mexican Flavours! Mexican Vegetarian Tacos. 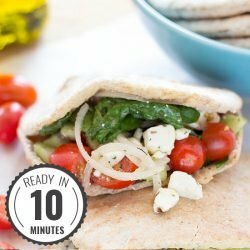 Incredible taste with loads of veggie fiber and protein means this recipe makes you wonder why you ever wanted meat in the first place. Slice the onion into thin “half-rings”. Slice the bell pepper lengthwise, also thinly. Pour the olive oil into a pan and add the pepper and onion. Set to medium heat and cook for 5 minutes. Now onto the Pico de Gallo: Peel the avocado then mash the flesh in a bowl. Finely dice the onion and cut the tomatoes and mango into small cubes (here’s the easiest way to peel a mango). Off it goes to the bowl as well. Season with lime, salt and chopped cilantro. 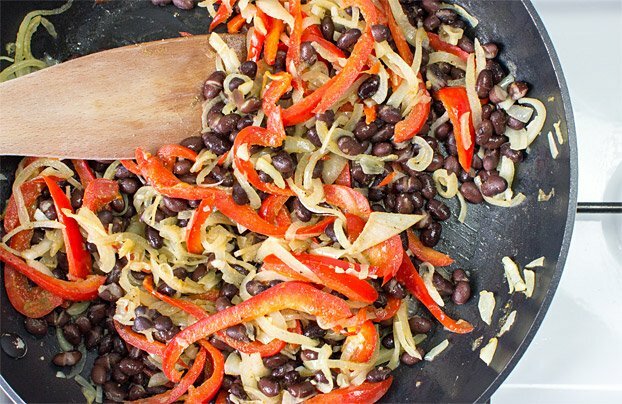 Add the black beans to the bell pepper and onion, stir and now season with cumin, salt and pepper. If you’re not a fan of the texture of beans (like Kat) you can mash them first (a fork or masher will do the job). Add the garlic too. Cook for another 5 minutes. Remove from the fire. Heat up the tortillas according to package instructions. 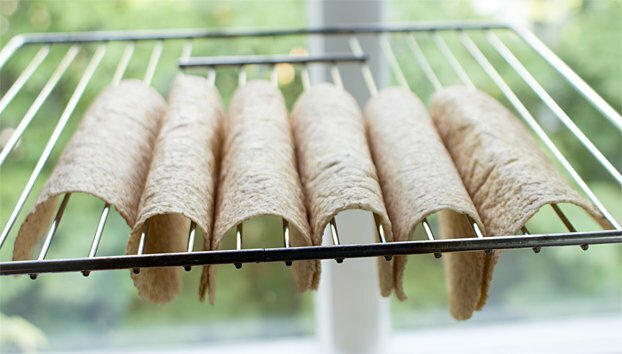 To make tacos from tortillas, simply hang them over the wires in your oven for 4-5 mins on 180°C/360°F, then remove. Assembling time! Grab a tortilla, fill it with some onion bean mix, add Pico de Gallo on top. Finish it off with a dollop of cream cheese, lime juice, cilantro and a spicy sauce of your choice. IF YOU LIKED THIS RECIPE: then you need to check out our sweet potato burritos. They hit right into the same alley and it’s really difficult to say which of the two recipes is better. Another Mexican winner is our meatless chili con carne. Enjoy! 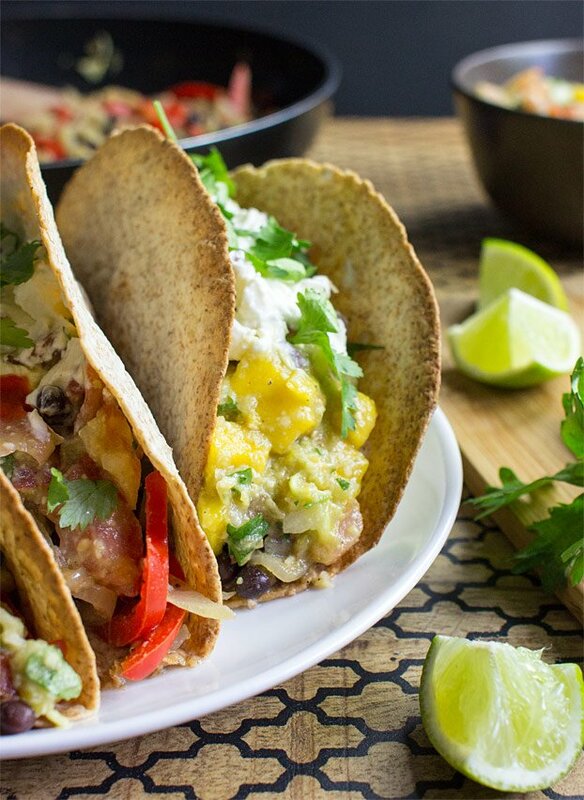 Lorena is the mastermind behind this vegetarian taco recipe. She’s an awfully good chef, loves Mexican cuisine and deserves all the credit for this one, thanks! they are very different ingredients! I’ve never heard of cream cheese on tacos before but sour cream absolutely. If you’re not into either, crumbling some queso fresco would be a great option. 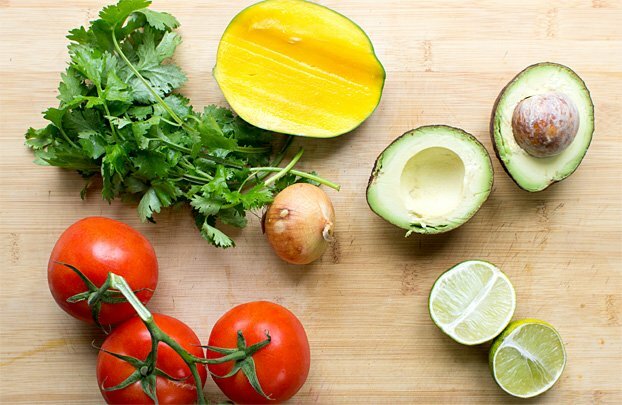 This mango salsa recipe is the best. My family loved it. The tacos are excellent – did not add the sour cream component and it wasn’t missed – with salsa this good. Woo! That’s really awesome to hear, glad you enjoyed it so much. Thanks for writing!! Hauke, Do the nutritional facts for this recipe represent 1 taco per serving? I am confused. There are 3 tacos on a plate, 6 in the recipe, but how many are considered 1 serving? Thanks!